Aura Glass is more than just an average startup business; it is the result of the unexpected experiences we as a couple have encountered throughout our personal and professional journeys. As we transitioned from the daily corporate grind to being fully invested entrepreneurs, we discovered the great rewards that come with transforming a shared passion into a unique product. Our arrival at entrepreneurship resulted from travels along an unpredictable route. My roots lie in India, where I was born and spent several years traveling abroad for both business and pleasure. Keven also traveled worldwide for his work, leading to a moment in 2010 when our journeys crossed paths. After losing touch for a couple of years, we reunited and developed the relationship we have today. Brought up worlds apart, from different religions, cultures and countries, we could never imagine in our wildest dreams that we’d be together. We grew fond of each other and connected over our mutual business experience, worldly views and entrepreneurial spirit. Respecting my cultural values, I asked Keven to meet my parents just four or five months after we started dating. My parents loved him—they even made a day’s trip to the U.S. to meet his parents—and voila! Here we are. The foundation of our relationship is very strong, because we made the impossible possible—and Aura Glass has been built with the same principles and values. Our shared passion for creation and creativity has resulted in this product. As cheesy as it may sound, we like to say that Aura Glass is our first baby. From the moment we first thought of this idea, we knew we wanted to create a product that was completely one-of-a-kind and beautifully designed. As we transitioned our skills in management and lean startups into Aura Glass, the company began to take form. We spent considerable time experimenting with the essential design elements, but more importantly, we market-tested the designs from the earliest stages to gain valuable customer feedback. As passionate entrepreneurs, we wanted to take all the right steps right from the start, including obtaining patents and trademarks. But what worked well for us was to not spend a lot of time and money before releasing the first version of the product. Starting out, we set up display booths at wine and liquor shops to gain feedback in exchange for some incentives. We also utilized platforms like Kickstarter to test our hypothesis. The Kickstarter campaign did not go as expected, but it helped validate price points, target customers, highlight product features and gauge demand. This is our two cents of advice to all entrepreneurs out there: test your product early on, before spending immense amounts of time and money only to discover you’ve created something that customers don’t want. It’s better to fail early on, and use that experience to create the next, better version of the product, than to fail later and give up on your idea altogether! But don’t think this approach requires less work. For us, it meant countless hours of unyielding effort. Early testing meant a much more intense prototyping exercise, and much more attention to detail to create the final product. Why? Because we knew exactly what was working and what wasn’t, and we weren’t willing to compromise on the quality of our product. Each day we analyzed our efforts, learned from them and moved forward toward our goals. Both Keven and I still have our full-time jobs, so before embarking on this adventure we knew we were signing up to work 24 hours a day, 7 days a week. After much effort and many sleepless nights, Aura Glass officially launched in December 2015. Through our website, we are now able to sell our exceptional glass products directly to consumers. Our first product is an artisan hand-blown Aura Glass. A specialty glass blower from Vermont crafts each glass by hand with care. We then assemble and test each product in Connecticut. That’s how we started to create this high-quality, exclusive product, and that’s what we want our customers to enjoy. Of course, this exclusivity comes at a price. 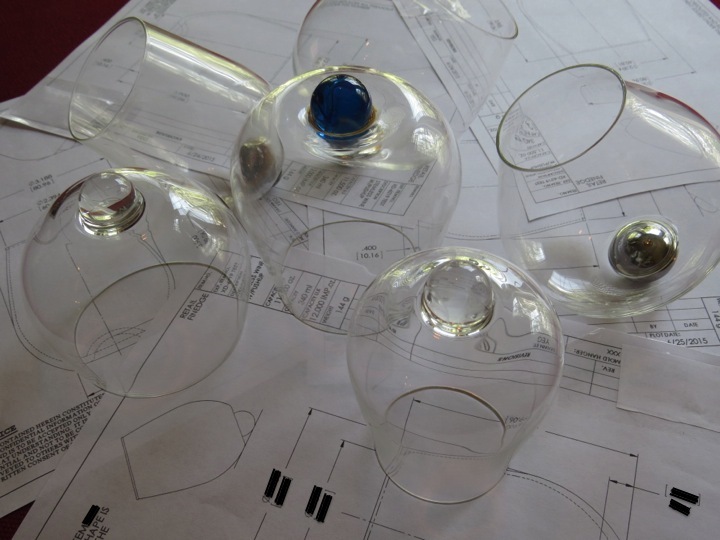 Each stemless glass we create is anchored by a stainless steel ball, which allows the piece to pivot a full 360 degrees when rested on a table. Checkout this 50 second video to see it for yourself. 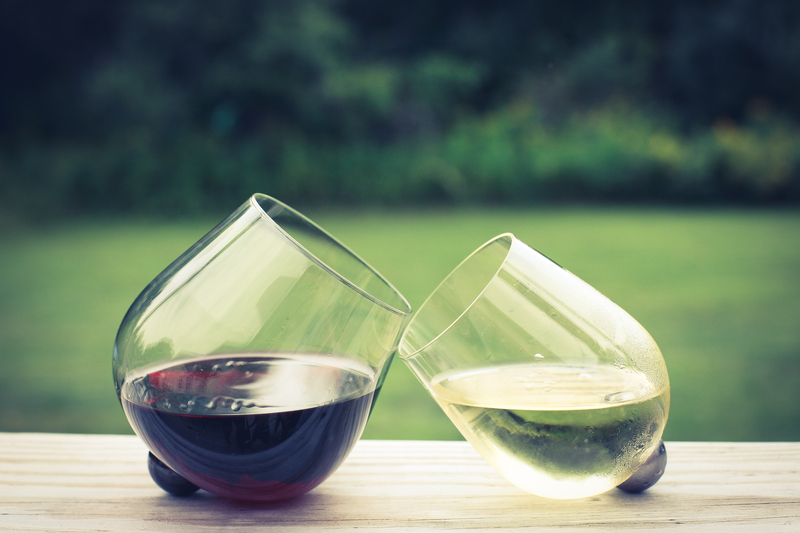 Not only does this design offer our customers an expressive and creative way to enjoy a beverage, but it also serves a functional purpose for wine enthusiasts. As the glass gently rotates, it blends the wine’s singular aromas and flavors. In order to create a second line of mid-range priced glasses without compromising the quality, we are exploring larger manufacturers within the U.S. We will never create a lower quality product — to do so would go against our philosophy. Quality is at the heart of Aura Glass, and we truly believe customer loyalty is a direct result of the perceived quality. Through Aura Glass, we are creating something more than a novel way of enjoying a beverage — we are crafting an elegant conversation starter, a unique drinking experience and a product that can enrich countless gatherings. Just as our own personal journey tells a story of making the impossible possible, Aura Glass has given life to a product that is anything but ordinary. Feel free to contact me at ankana@auraglass.com to know more about our journey and Aura Glass.